Braising is a cooking method that is perhaps a bit dated in terminology. Today, trendy chefs like to use the term confit whenever something is slowly cooked in mostly fat and liquid. Of course, the concept is identical to braising which relies on a small amount of liquid and fat to gently cook the food in low temperatures. In the end, the term doesn’t really matter much, because the outcome is simply outrageously delicious. The vegetables all hold their shape and color and turn butter tender while draped in a glistening syrupy sauce. 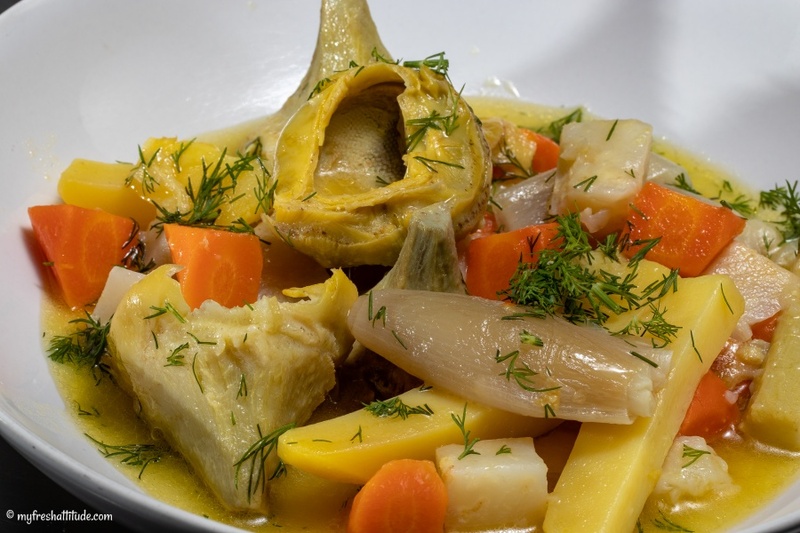 This dish uses the freshest artichokes and combines them with celery root, potatoes, carrots and shallots. The combination is one I first encountered while reading Paula Wolfert’s wonderful book on The Cooking of the Eastern Mediterranean. Apparently, the idea of this dish originates from Istanbul, but I think it could easily represent a dish you find in Italy or a rustic restaurant in the south of France. You can easily make it your own by using different vegetables in the mix…think fennel, other root vegetables, salsify, Jerusalem artichokes… Get the idea? Enjoy this delicious offering served hot, warm and even cold!